To Sled or Not to Sled? 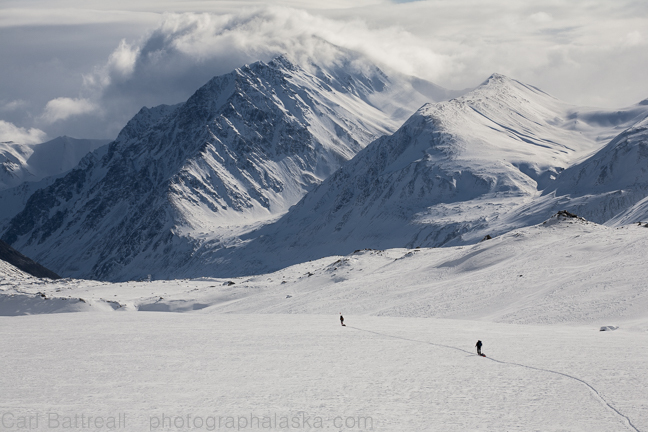 Sleds, or ski pulks, have been part of my Alaska explorations for as long as I can remember. And like most explorers of snowy regions, I have a love-hate relationship with them. The terrain I may encounter is the primary factor when deciding on whether to bring a sled or not. Is there steep terrain? Will there be lots of bush whacking? Heavily crevassed glaciers? Dirt? So many possibilities can be encountered traveling through Alaska’s mountains. 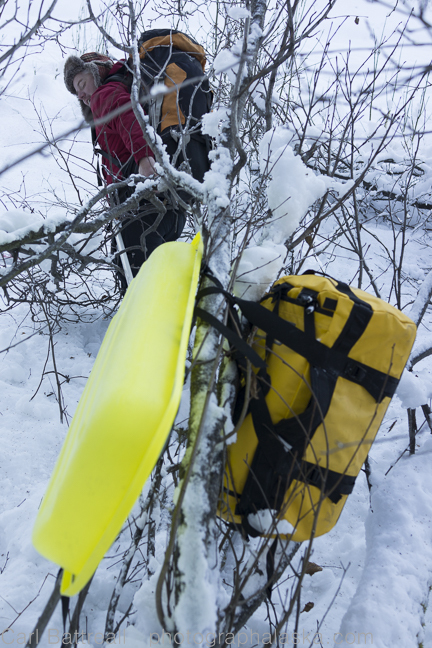 On long, mellow trips, over easy to moderate terrain, with extensive winter gear and camera equipment, the comfort and ease of a sled is hard to beat. Two trips this spring warrant the use of sled, long glacier ski tours. One trip, to the Eldridge Glacier, has some big crevasses, but its early season and they should pose little difficulty. The second trip, to the Kichatna Mountains, should also be perfect for sleds. This is the terrain that sleds were meant for. The Black Rapids Glacier, during a 2006 traverse. I have many times, brought a sled when I should have brought a big pack. What looks good on the map, doesn’t always translates to reality. A short, steep, alder choked slope can be a nightmare, taking literally hours to negotiate. Whenever there is a possibility of coming across bushy terrain, I make sure I have a good system for carrying my sled on my back. Mountaineers are notorious for overloading sleds, paying very little attention to their design or the packing of them. I have been learning lessons from many of my winter, distance racing friends, and I have decided to give my sled an overhaul. The goal is to make it more streamlined and less haphazard. I will also be switching to a fully rigid system (designed by skipulks.com) removing the annoying slack that has the sled chasing, and frequently crashing into me, or passing me or worse of all, rolling down every hill or bump. Overloaded! 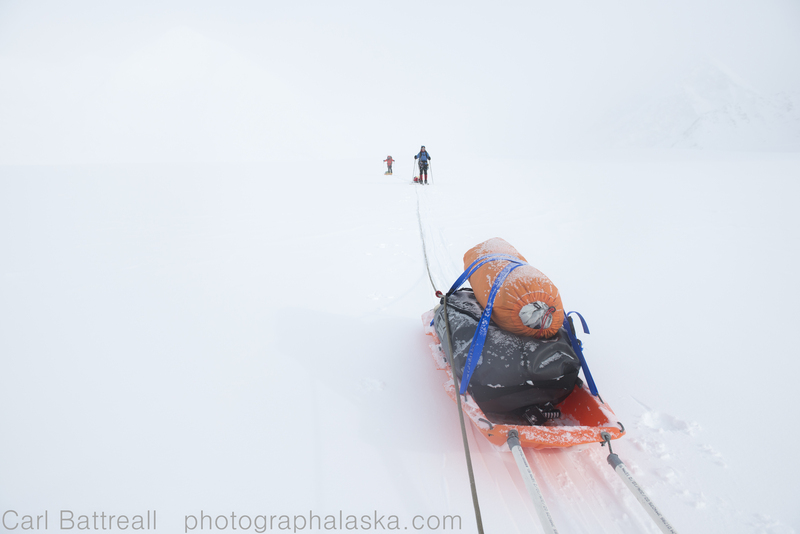 This is my sled on a ski traverse of the Kahiltna Glacier in 2013. Its way too top-heavy and I am not using all the space in the sled. I plan to fix this problem and reevaluate my sled packing and design. I will post images of my revamped sled on the #photographalaska facebook and Instagram pages so make sure your following them if your interested. Or course, full trip reports will be posted here on the blog when I return.